Only BTC and ETH are accepted. Please don’t send other currency. Minimum contribution – 0.1 ETH. You can send ETH or BTC using ERC-20 compatible wallets. You can also send ETH/BTC from exchanges. Make sure you copy exactly the wallet number we provide. Please follow these instructions carefully, as well as any relevant instructions for e-wallets and crypto exchanges, to make sure you contribute to our ICO securely, and ensure your contribution reaches Scrinium in time. Sign in or sign up at Scrinium. Choose the cryptocurrency you want to contribute in. Give us your ERC-20 compatible ETH wallet for purchased coins to be credited there. Calculate the amount you want to contribute using our converter. You’ll be shown a wallet number you can send coins to – copy it to your clipboard or scan the QR code. 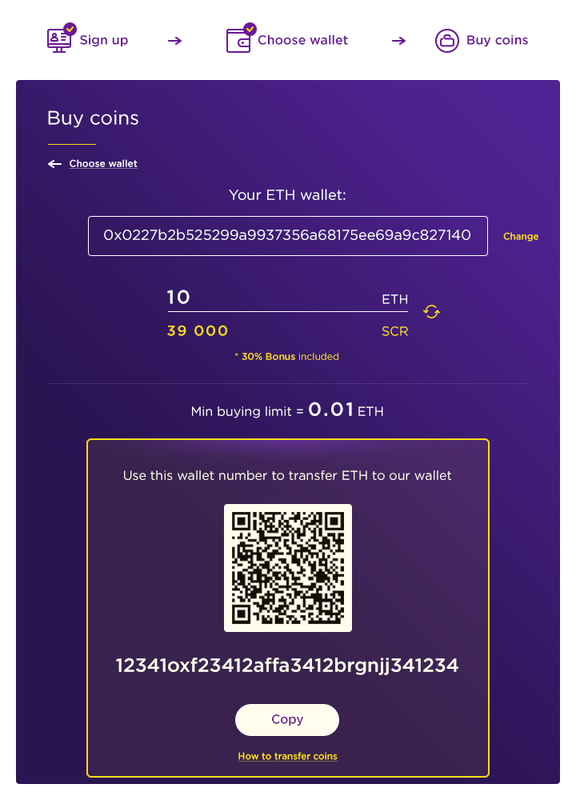 Go to your wallet or cryptocurrency exchange wallet (make sure you use an ERC-20 compatible wallet). Put the amount you calculated in step 4 in the Amount field. Paste the wallet address you copied in Step 5 into the Address field. When your contribution reaches us, you’ll receive an email, so we recommend you check your inbox regularly. You’ll also be able to see the balance of the coins you credited while signed into our website. Please note that Scrincoins will be credited to your wallets within seven days of the pre-ICO end date (11th January). Coins bought during the ICO will be credited within seven days of the ICO end date on 11th March. To send tokens, choose Send Ether & Tokens. Paste our address in the address field. Please note that you can use any wallet (as well as exchange wallets) to send your cryptocurrency to our address. You understand that your Scrincoin allocation will not happen immediately. The coins will be credited to your wallet within seven days of the end of the pre-ICO (on 11th January). You’re more than 18 years old, and not restricted from using our website, participating in the Scrinium coin sale or conducting any activities with cryptocurrencies. You won’t be using Scrinium for any illegal activities.